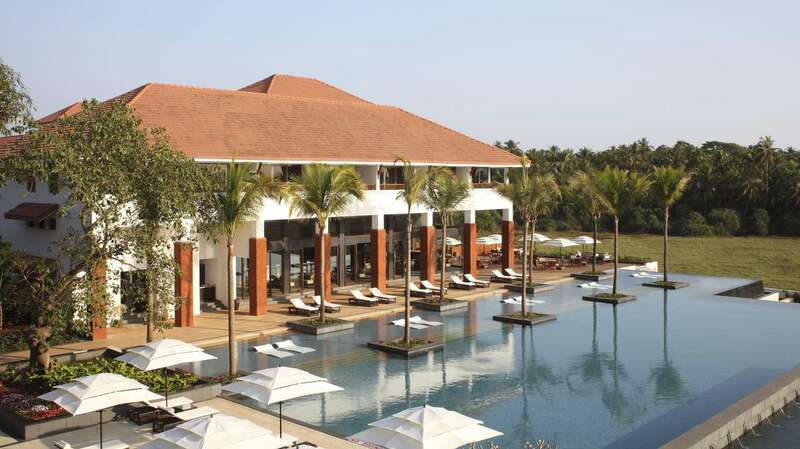 Alila Diwa Goa brings a refreshingly contemporary twist to the hotel scene in Goa. It offers a serene rice plantation setting, only 20 minutes from the airport. Situated amidst lush paddy plantations, Alila Diwa Goa is a luxury hotel in South Goa along Gonsua Beach in Majorda, just 20 minutes from Goa Dabolim International Airport. Located in the picturesque Village of Majorda, Alila Diwa Goa nestles within nature, spectacular views stretching before you, lush green rice fields, a gorgeous sandy beach, the sparkling Arabian Sea. The subdued rooms come with free Wi-Fi and flat-screens. All offer balconies or terraces; some have in-room baths and/or wood-panelled ceilings. Suites add living areas. Complimentary amenities include breakfast and parking, plus 2 restaurants and a bar. Other amenities include an outdoor infinity pool, a hot tub, a spa and a fitness room, plus kids' clubs. The hotel's Diwa Club is an enclave of exclusivity, boasting its own lap pool with an open air Jacuzzi and hot tub. Sail on the beautiful River Sal observing the birds, the fisherman and life on the river banks while trying to catch a crab. Take a scenic drive during the wee hours of the morning to the bustling fish market. Beautiful hotel in a quiet part of Goa with a large pool, attentive staff and delicious food.